What’s in the 2015 Autodesk Simulation Portfolio? Synergis Engineering Design Solutions is a Simulation Specialized partner with over 25 years experience as an Autodesk reseller. We can help you understand simulation, which products would be best for your business, and implement and train your staff so you can build less prototypes and hold on to your bottom line. Want to learn more? 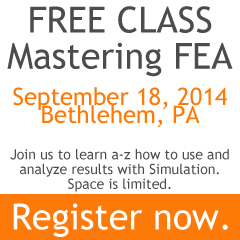 We are offering a one day , FREE Mastering FEA class on September 18 in Bethlehem, PA. If you are in the area, click here to register and reserve your seat today! Not in the area and you want to learn more? Contact us or ask an expert a question here. Amazing site, thanks for sharing ! !